Sarah Redmond of Springtide Seaweed harvests kelp from an aquaculture site off Preble Island in Sorrento in this undated photo. The company has applied to the state to lease a second site in Frenchman Bay off Stave Island in Gouldsboro. A Gouldsboro organic seaweed aquaculture firm is hoping to lease a site in Frenchman Bay that could help to significantly boost its output. Springtide Seaweed, a company founded in 2017, already operates a 35-acre cultivation site in the bay, off Preble Island in Sorrento. If it is granted a lease for a 20-acre site off Stave Island, it could triple the annual output of its finished, dry product to 75,000 pounds, according to company officials. The company has applied to the Maine Department of Marine Resources for a 10-year lease for a site west of Stave Island. On Tuesday, a public hearing on the application was held at the town office in Gouldsboro. None of the half dozen members of the public who attended the half-hour hearing raised any objections to the proposal. The state is expected to make a decision on the lease application within 120 days, according to DMR’s Flora Drury. Springtide Seaweed grows mainly kelp but also is developing products from dulse and nori seaweed varieties, according to Sarah Redmond, founder of the company. The firm converts the kelp into different products at its processing site in the village of South Gouldsboro, which the company just moved into last year. Among its products are powders that can be used as culinary seasonings and salt substitutes. Redmond, a longtime associate with the federal Sea Grant program, said Tuesday that she has been involved in seaweed aquaculture since 2010 and continues to develop methods for seaweed cultivation at the University of Maine’s Center for Cooperative Aquaculture Research in Franklin. 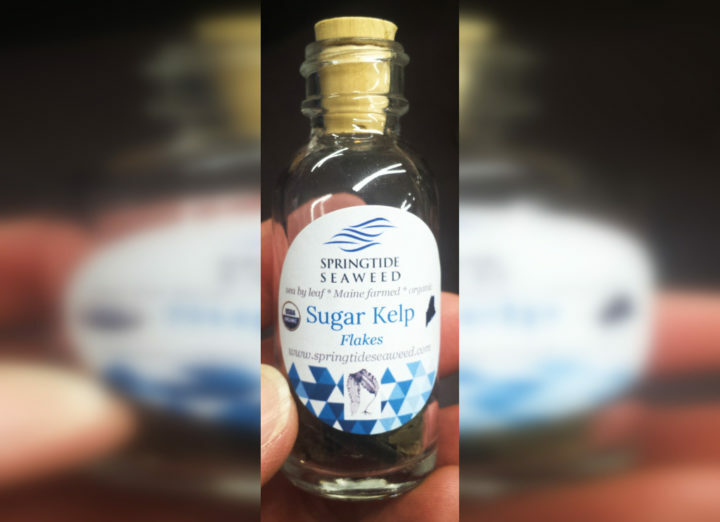 A sample bottle of Springtide Seaweed sugar kelp flakes. Redmond said there is a lot of room for growth in Maine’s aquaculture industry, and that it can be done sustainably without competing with other marine activities. Operations at the Frenchman Bay site would take place from September through the end of June, with seaweed growing through the winter, Redmond said. The seasonality of the operation would help minimize conflicts with lobstermen, who tend to set traps near shore in the summer but further out to sea in the fall, when lobster fishing is heaviest, she said. “Most of the activity takes place in the spring when you have to harvest the lines,” she said. In the fall, the lines will be seeded with seaweed spat that the company cultivates on land. The lines — nine in all — would measure about 1,000 feet long and would run parallel to each other and to the surface of the water. A recent petition submitted by lobstermen to state officials about limiting aquaculture operations shows how important it is to find lease sites that have little to no impact on other marine activities, Redmond said. She was particularly interested in the site west of Stave Island because in 2012 it was approved for use as a cod farm that never materialized, she said. When that proposal was submitted to DMR, no one raised any objections. “It isn’t an area that is heavily utilized,” Redmond said. 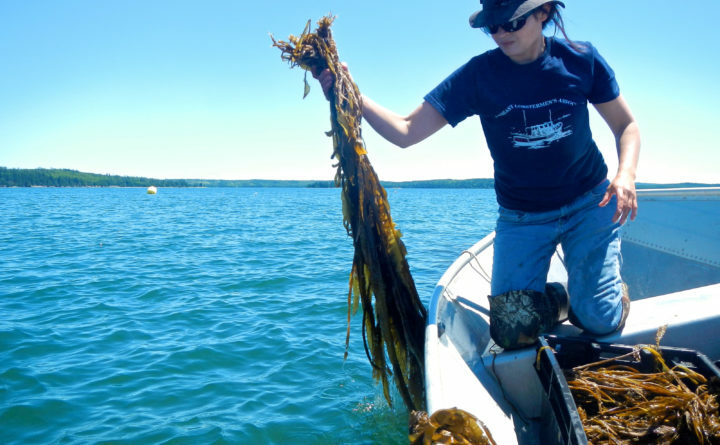 Springtide also is partnering with College of the Atlantic in Bar Harbor, where it has helped students learn about organic seaweed cultivation and hopes to develop a wet research lab. She said she wants to share what she has learned about organic seaweed aquaculture and help the industry grow and be sustainable.